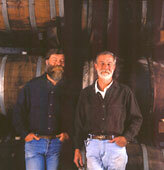 Smith-Madrone is a family-run estate-bottled winery dedicated to producing fine wines exclusively from its own vineyards. The winery was founded in 1971 with the purchase of 200 acres high atop Spring Mountain west of St. Helena in the northern Napa Valley. One of the least-known and most scenic appellations of the Napa Valley, the Spring Mountain District was recognized by the B.A.T.F. in May of 1993. The winery enjoys dramatic views of the floor of the Napa Valley and the Sierra Nevada Mountains in the distance, as well as of its own steep dry-farmed vineyards. Smith-Madrone is located at elevations between 1,600 and 1,800 feet 1,300 and 1,900. The vines flourish in vividly red and rocky volcanic soil known as Aiken loam, which is well-drained and friable. In exploring the property before purchasing it, Stuart Smith discovered old grape stakes interspersed with the tall trees, evidence of a vineyard planted in the 1880s and abandoned with the onset of Prohibition. Douglas fir, oak, redwood and madrone trees were cleared, and the vineyards planted. The name for the winery has two sources: as a tribute to the Smiths who pursued their dream and to the madrone trees which distinguish the property. As the estate was developed, traces of its intriguing history emerged. George W. Cook, who received title to the property from the United States Land Office in 1884, planted the original vineyard at that time. As Chinese workers cleared the land in the mid-nineteenth century they left behind meticulous rock piles, stone walls and underground caves. The remains of a covered wagon sit on an old road between Santa Rosa and the floor of the Napa Valley: today this road is barely passable and is used only for access by foot between Smith-Madrone and Stony Hill Vineyard to the east. 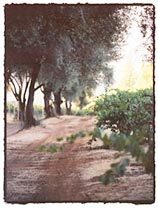 Another striking historical and visual note is the dramatic corridor of 22 olive trees which descend the slope beneath the winery into the vineyards. More than a hundred and twenty years old, these trees were carefully preserved when the vineyards were planted. Their huge proportions (some stretch as tall as 35 feet) are a testament to their struggle for precious mountain sunlight. A walk around this ranch means panoramas of vineyard, mountain and forest, thriving with wildlife and the natural world, since the forest encloses all of the vineyards. Deer, fox, rabbits, porcupines, coyotes and the occasional bear and cougar are visible. The largest recorded bear in the history of the state of California was killed nearby in 1967. The bird population includes red-tailed hawks, golden eagles, turkey vultures, piliated woodpeckers and spotted owls. Three rare thorny nutmeg trees sit on a knoll; the stump of an oak tree was chosen by the woodpeckers as a whimsical warehouse, loaded with acorns for winter sustenance.